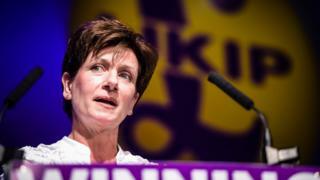 Former UKIP leader Diane James has resigned from the party, saying it is "time to move on". The MEP said her relationship with UKIP had become "increasingly difficult" and that she had been offered no support by the executive during her leadership. Interim leader Nigel Farage said her decision was "yet another act of irrational selfishness" and she was no longer fit to sit as an MEP. Mr Farage is back in charge on an interim basis, with UKIP currently engaged in another leadership contest. In a statement Ms James said she would continue in the European Parliament as an independent and would continue to serve her South East England constituency "effectively and diligently". She said she had quit as leader because she had been unable to carry forward the policies she had campaigned on because of a lack of support. "In recent weeks, my relationship with the party has been increasingly difficult and I feel it is now time to move on," she added. "I wish the party well for the future under new leadership." Ms James becomes the second high-profile party figure to quit UKIP in recent weeks, after her fellow MEP Steven Woolfe resigned after a confrontation with a colleague in Strasbourg. And her departure means that the 24-strong contingent of UKIP MEPs elected in 2014 has been reduced to 20, with Amjad Bashir and Janice Atkinson also having left the party. UKIP's new leader will be announced on 28 November. Paul Nuttall, Suzanne Evans and John Rees-Evans are vying for the job. Ms Evans said she was "very sorry" Ms James had quit, but urged her and Mr Woolfe, along with other MEPs who quit UKIP, to vacate their seats as they been elected on a party ticket. Mr Farage added: "She should do the honourable thing and resign." Meanwhile, an MEPs' group dominated by UKIP has been told to repay 172,655 euros (£146,911) after the European Parliament ruled it had breached party financing rules. It comes after an audit into the Alliance for Direct Democracy in Europe's spending was leaked last week. ADDE, which was founded by UKIP in 2014, attacked the parliament's verdict and said it would take the matter to the European Court of Justice.